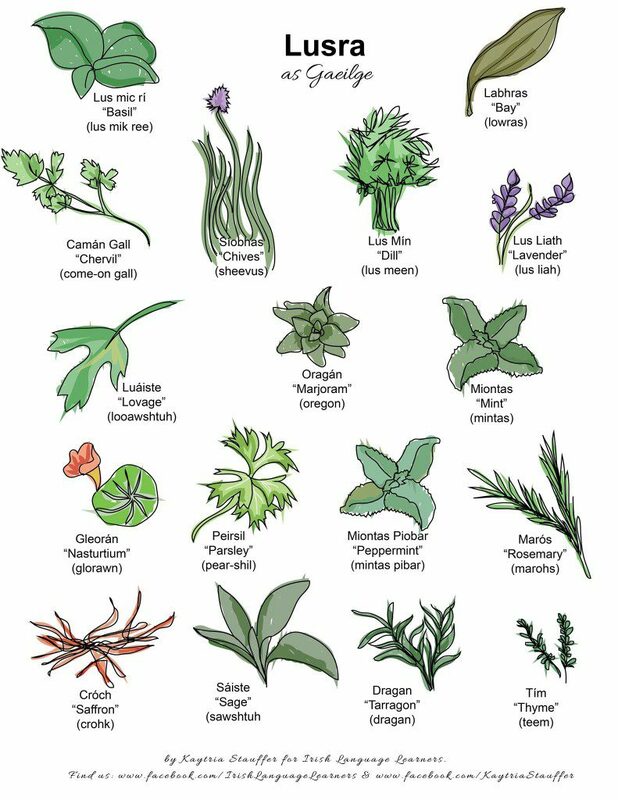 Irish Gaeilge names for herbs by Irish Language Learners, a great site for learning the Irish language! Do you feel the January blues? I sure do. Forgetting your resolutions of a week ago? Me, too. I’ve caught myself nearly giving in to a habitual craving for booze even though I’ve imposed a dry time for myself. January is hard for me, friends. February and March aren’t exactly my buddies either, but I’m at least starting seeds by then. January is just cold. Wet. Gray. I’ve been procrastinating in almost every aspect of my responsibilities, but managing to pull myself up by the bootstraps and finish deadlines…just barely! One of the things helping me find my get-up-and-go is good nutrition and hydration…feeling icky? Have a glass of water! Having a hard time rising above winter torpor and moving your body? Maybe you need a bitter tonic. You can see a recipe for a tasty bitter tonic tea over at the Herbal Academy of New England, my most recent article over on their awesome educational site. Oh, and while I haven’t been writing like I should, I’ve been tinkering with Pixie’s Pocket. I’ve given a facelift to a few pages on this here website. If you are keen on reading and need a suggestion for herbal, gardening, brewing, or cooking reference books, pay a visit to The Pixie’s Bookshelf! If you are interested in oracles, divination, and tarot, you should check out the updated Tarot & Divination page! Aaaaaand I entered the rabbit hole that is Tumblr. Join me, dears! Are you in California? Get organic produce delivered to your doorstep! How do you know if your stored seeds are any good? How should you store them for long-lasting viability? Northwest Edible Life has updated their page about Seeds For Beginners: Saving, Storing and Organizing Your Vegetable Seeds – are you a new gardener or one that needs a few tips and tricks in handling surplus seeds? This is the guide for you! If you are like me, you’ve been daydreaming of the warmth that must come with spring. With the 2015 garden season in mind, you’d better be taking notes while you are flipping madly through seed catalogs. The Schneider Peeps offers a gardening notebook that has more than just a record book…tips, tricks, and notes to help you along. Keep track of your successes and failures to become a better gardener! Speaking of daydreams…I’ve never yet tried to grow my own mushrooms in a log. Little House in the Suburbs just had their mushroom log inoculation day! I hope to do that at some point. I love fresh shiitake! Oh, and if you need a giggle, check out this webcomic: XKCD covers gut flora and holistic diets. THIS STOVE. I mean. Just look at it! This weekly post is brought to you by two wonderful magic workers in the Canary Islands! Camino De Yara provides tarot and oracles readings, candle work, and also sells sustainably wildcrafted Canarian herbs. The artwork that Carolina and Fernando create is breathtaking. Take a moment and browse their wares. Don’t forget to take advantage of the 2015 Forecast Card Reading available only this month! January is hard for me too and I live in the south. You guys up north are rock stars in the winter. Thanks for the suggestions for helping with the blues. Ha, thanks, but I can’t take that credit! I’m actually in North Carolina, in Asheville. We’re up in the mountains, so we do get colder than the coast, but I’m definitely not used to REAL cold. 🙂 But I guess that we are pretty North of Texas!